In this poignant and honest interview with Diane Sawyer on ABC’s 20/20, Sue Klebold shares and answers the tough questions on people’s hearts and minds regarding the Columbine massacre. 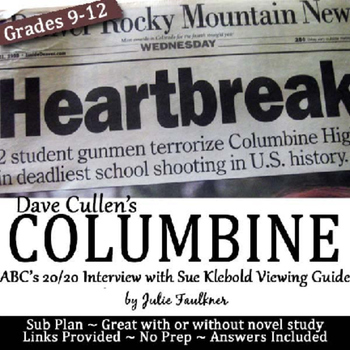 Viewing this documentary is essential if you are studying Dave Cullen’s nonfiction piece Columbine, but it is also an excellent documentary to watch for the historical connection and valuable message it shares. Students explore not only the content and characterization presented in this heart-felt documentary, but also they will analyze and connect with themes that transcend any tragedy. ← We Teach So Hard…Episode 24…Brace Yourself & Gird Your Loins! It’s Teacher Evaluation Time!